Today’s card is being featured on Stylin’ Stampin’ Inkspiration. 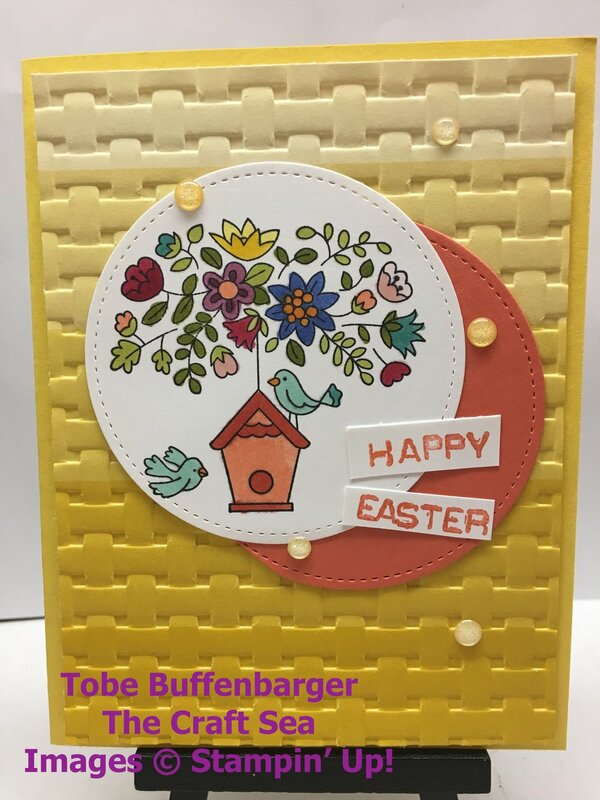 The challenge was to create an Easter card. The Flying Home stamp set is the perfect choice to create a festive card. I stamped and colored this great floral and bird house image using my Stampin' Blends. I simply colored the image, no modifications made. From there, I layered the piece onto a die cut piece of Calypso Coral and added a simple sentiment. As I don't have a "Happy Easter" stamp, I used the labeler alphabet to create one. For the background, I embossed a piece of Color Theory DSP. I love the ombre effect in the background. For a finishing touch, I added some yellow Glitter Enamel Shapes.